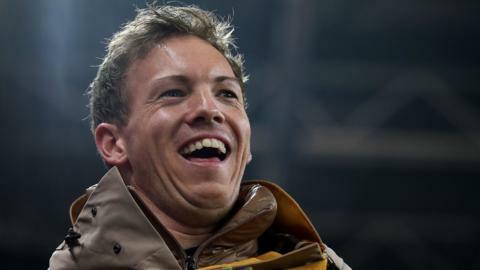 Hoffenheim boss Julian Nagelsmann watches his side earn a 1-1 draw to stop RB Leipzig - where he takes over in the summer - from going third. Bundesliga leaders Borussia Dortmund throw away a Jadon Sancho-inspired 3-0 lead to draw against Hoffenheim. The use of a drone during Hoffenheim's final training session before a Bundesliga game is being investigated by German police. Manchester City's qualification for the Champions League last 16 was an "incredible success", says manager Pep Guardiola. Bundesliga leaders Borussia Dortmund squander a three-goal lead against Hoffenheim to draw 3-3, despite England international Jadon Sancho's opener.